If, as a result of the negligence of a third party, you have sustained a brain injury then we can help you claim not only compensation but also we will make sure that you receive the treatment you require to help your recovery and to make a return to your pre-accident life. We understand how important it is to put in place support for those affected by a brain injury and to offer a complete service with regards to you and your family. Whatever the cause of the effects of a brain injury can be devastating. Severe brain injuries can result in significant ongoing cognitive deficits including a reduction in verbal comprehension, perceptual reasoning, working memory and information processing speed. A person can be left with significant problems with their mental functionality which can manifest itself in an inability to organise and plan, reduced motivation and dis-inhibition. In some cases, a person can be left with ongoing epilepsy necessitating permanent medical treatment. In addition, paid employment may no longer be possible and the affected person may require significant levels of support and monitoring. This can put severe pressure on family members. We have the knowledge and expertise to ensure the best possible settlement for your claim. 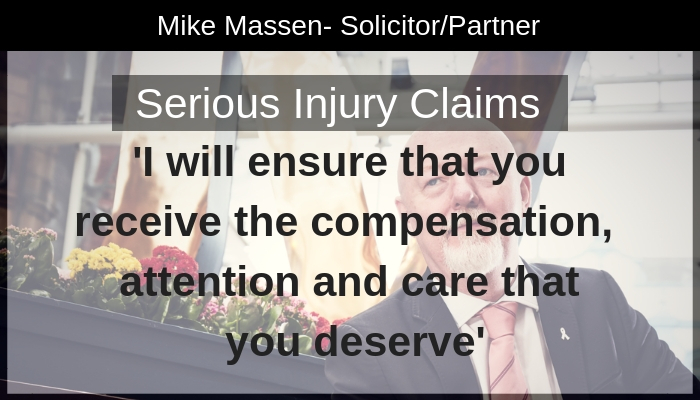 As well as securing compensation for your pain and suffering and loss of enjoyment of life and all your treatment and rehabilitation we will also look to recover all and any financial losses arising from the accident that caused your injuries. More importantly, we will liaise with case managers and the providers of rehabilitation and treatment. If required we will look to obtain an interim payment (basically an advance on your final settlement) to make sure that you get the treatment you need, when you need it. We will do this with practical and compassionate help whilst at the same time delivering the outcome which you deserve. Your claim can be dealt with on a no win no fee basis so if your claim fails you won’t have to pay us a penny for the work we do on your behalf.